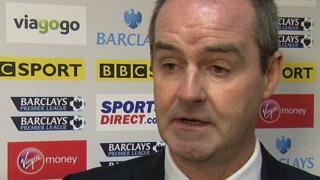 West Brom boss Steve Clarke says his team did not deserve to lose 2-1 at Newcastle, after Papiss Cisse's last minute deflected winner gave the Magpies three points. Demba Ba put Newcastle ahead in the first half, but Romelu Lukaku's header put West Brom level after the break. The match was won when Sammy Ameobi stuck a shot from distance which hit Cisse and left Albion keeper Ben Foster stranded.